A few weeks ago, I attended a Gray Family reunion. I married into the Gray family on June 4, 1967. Although Lawrence “Lonnie” Gray and I dissolved our marriage vows in 1981, we later developed a friendship based on our mutual love for the children we nurtured together, and I remain attached in name and spirit to this wonderful, splendidly unconventional family; unconventional because being a part of this family sticks until forever whether membership came through marriage or birth. Once a Gray, always a Gray, and that goes for ex spouses and stepchildren no matter what the legal system might dictate. Bonnie was a joy to travel with because she became excited at nearly every thing she saw and her face would light up with child-like happiness at the slightest provocation. Once on a trip to Tennessee, she spotted a dog coming out of the forest and thinking it was a bear, pleaded with me to stop so she could take a photo. When she discovered it was only a shaggy, spotted dog, she took the photo anyway. I still have that photo in an album to remind me of the fun we had together. Bonnie and Lonnie are gone now, but my memories of them deepen my understanding of family and how those relationships directed my life and helped form the person I became. My brother-in-law George also stayed in touch and for many years he made periodic stops at my home in Wyoming and continued to find reasons to visit once I moved to Colorado. Occasionally, he brought one or both of his daughters, Julie and Joanna (Jo Jo on the go go as we called this little spitfire of a girl), to spend time with me during their summer vacations from school. On one of those visits, George and Jo Jo delivered a chocolate Poodle that I had purchased during one of my trips home to Kansas and I quickly named this small dog Jo Jo because she sprinted from place to place as feisty as her namesake. 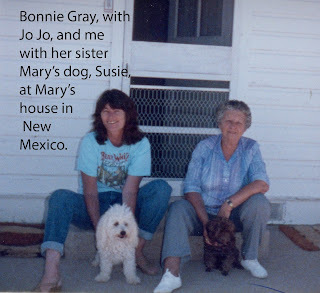 Jo Jo the poodle remained a part of my life for many years, even as Jo Jo, my precious niece, grew to womanhood and went out in the world to make her life in the military, later as a contractor for the military and as a wife and mother. I was happy to find her at the reunion as spunky but special as ever. Julie, the quieter, more serious of the two, stayed close to home in Kansas. Although she too became a mother and has matured, I still see in her that sweet-natured little girl who spent hours quietly playing with her plastic horses in our yard in summer and the living room in winter. Lonnie called her Baby from the first minute he saw her and that became the first word she spoke. When she saw him on the street, she would shout at the top of her tiny lungs, “Hi, Baby.” He would break into a huge grin and shout, “Hi, Baby,” back to her. As the years went by and lives changed, the Gray family like so many others drifted to other places and life somehow got in the way of keeping in touch. An occasional connected event like a graduation, wedding or funeral might lead to a brief encounter, but mostly we have gone about living oblivious to how quickly time and life slip away from us. There is an old saying that we choose our friends but not our relatives. Not so in the Gray family where the ties of friendship remain as relevant as bloodlines no matter how far life distances us from one another. Our memories remain embedded forever. 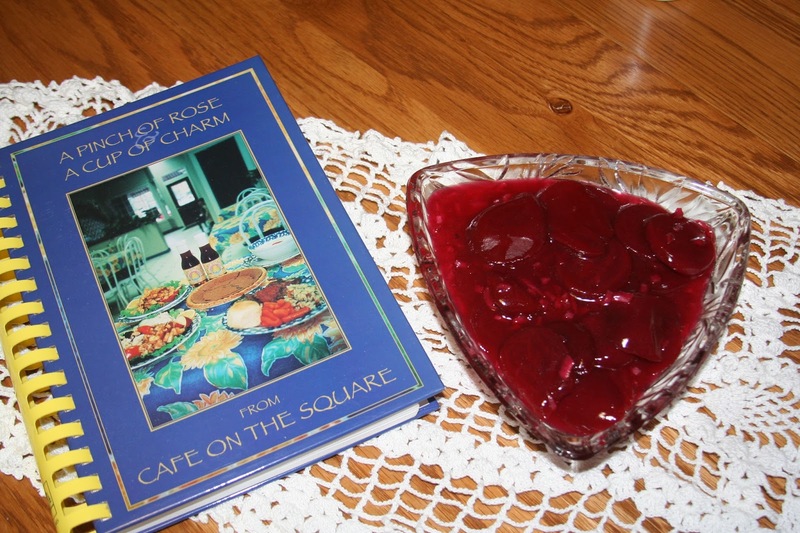 Attending the reunion of Bonnie Gray’s descendants brought to mind the Harvard Beet recipe she consistently requested I make when she visited our farm near Solomon, Kansas. The original recipe used beets freshly dug from the garden, but canned beets also work well and save the added steps of pre-cooking until tender (about 20 minutes), peeling and slicing the beets. 1. Combine sugar and cornstarch in a small saucepan. 2. Stir in vinegar and reserved beet juice or water and cook over medium heat until liquid begins to thicken. 3. 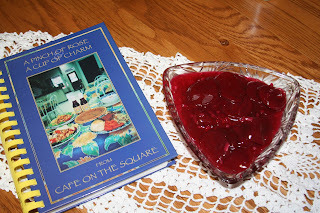 Add minced onions and drained beets, lower heat and simmer 20-25 minutes. 4. Stir in butter and season with salt and pepper. Can be served warm or chilled.